the look that I show you today is very casual and focuses mostly on these military green pants from Zara, bought some time ago but very current for this season. To them I have combined a maxi perforated pull, bag with studs, vest and fedora hat model. What about the result? il look che vi mostro oggi è decisamente casual e si concentra per lo più su questi pantaloni verde militare di Zara, acquistati un pò di tempo fa ma molto attuali per questa stagione. Ad essi ho abbinato un maxi pull traforato, borsa a sacco con borchie, gilet e cappello modello borsalino. Cosa ne dite del risultato? I love your bag! Is awesome!! Very great pants and a wonderful look... - love it! This is such a beautiful outfit! I really love that hat. Those are some great pants, I want them. 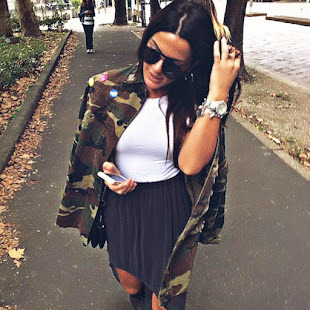 Great look and great post! really great outfit! totally love it!! Nice outfit ... love your boots too !! The military look is very "in" right now, and you so did it right pairing the pants with that fabulous fadora. Gorgeous outfit, girl!